Tax changes and benefits will provide challenges and opportunities for the NFP sector, according to Commonwealth Bank economist James McIntyre. SPONSORED: This article is by Commonwealth Bank economist James McIntyre is part of a regular series of articles by the Commonwealth Bank, who will be using their financial experts to provide news, insight and expert advice for Not for Profit organisations. compensation measures and other changes to the personal tax and transfer system. The changes are likely to see struggling households boosted in the short term, reducing demands on the Not for Profit sector over the next few months. However, the number of households needing assistance is likely to rise after the assistance payments are spent and bills continue to arrive. The cessation of the flood levy for higher income households offers a savvy opportunity for the Not for Profit sector to potentially raise donations. increase in costs associated with incorporating a price on the carbon content of goods and services in the economy. The increase in costs is equivalent to a 0.7% increase in the CPI. For many households, particularly those on middle to lower incomes, the compensation averages around $10.10 per week. This offsets the potential hit to budgets for those households who do not respond by changing their purchasing behaviour towards lower carbon (and therefore lower cost) options. Higher income households have received less compensation, given their greater capacity to lower their exposure to carbon-related cost increases by taking up lower carbon options or switching to more efficient practices. households has been delivered two ways, through tax cuts, and through up-front payments. Those payments started arriving in the middle of May, and have now been fully delivered. Parts of the Not for Profit sector that provide assistance directly to households may have noticed the financial boost for those that have been struggling. Figures from the retail sector suggest the boost has lifted household spending. In a response that was similar to the delivery of the stimulus payments during the GFC, the $2.3bn of household assistance payments resulted in a strong jump in retail spending in May. A further retail lift is likely when the June figures are published. But whilst the spending of assistance payments is temporarily benefitting the retail sector, and potentially easing the burdens on strained households, the increases in costs (e.g. the $3.30 per week electricity bill impact) may not become apparent for many households until quarterly bills arrive. Those households that have been in reliant on assistance from the not for profit sector in the past may find they need to return to the sector for assistance again. 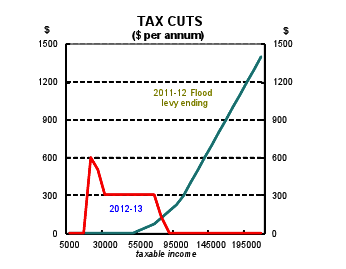 Meanwhile, the removal of the 12-month flood levy means that higher income earners are also receiving a ‘tax cut’ from 1 July. Income tax cuts at the upper end may provide an opportunity for the Not for Profit sector to raise donations. The cut is worth $250 per annum for a taxpayer earning $100k, and $1250 per annum for those earning $200k. Carbon pricing impacts on the NFP sector – Many organisations in the Not for Profit sector may be impacted themselves by higher costs stemming from the impact of the carbon price. There are already a number of reasons to find smarter ways of doing things, and the carbon price is another catalyst encouraging organisations – Not for Profit and otherwise – to adapt and change the way they operate. In many cases the benefits of changing to adapt to a carbon price can actually result in lower overheads in the longer term, which means more for recipients of the invaluable services provided by the NFP sector.